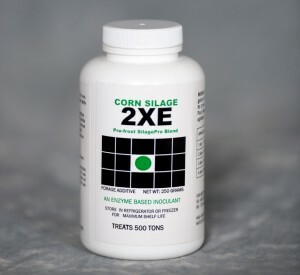 This enzyme based inoculant is a specially formulated corn silage treatment. For maximum shelf life, store SilagePro® 2XE in refrigerator or freezer. − Specialized pre-frost corn silage SilagePro® blend. − Four cascading bacteria (Enterococcus faecium, Pediococcus pentosaceus, Pediococcus acidilactici, and L. Plantarum) that supplement lactic acid bacteria in corn silage. − Full dose of SilagePro® enzymes to enhance fiber digestion. − Min Lactic Acid Bacteria (Guaranteed): 200 billion CFU/g. − Provides in excess 100,000 CFU/g of silage. − 250 gram jar treats 500 tons.